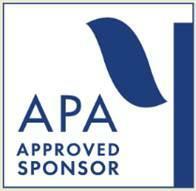 The Training Institute-Southwest Behavioral & Health is approved by the American Psychological Association to sponsor continuing education for psychologists. The Training Institute-Southwest Behavioral & Health maintains responsibility for this program and its content. The Training Institute-Southwest & Behavioral Health has been approved by NBCC as an Approved Continuing Education Provider, ACEP No. 6368. Programs that do not qualify for NBCC credit are clearly identified. The Training Institute-Southwest Behavioral & Health is solely responsible for all aspects of the programs.